Summary: The 3rd Bowl was poured out as the bloody French Revolution spread out from the major cities (seas) to the more rural areas (rivers and springs, smaller groups of people) where they had shed the blood of saints and prophets, and now it was time for them to drink the same fate. 1540-1570 A.D. – Papal Rome sent army after army of Roman Catholic soldiers into southern France and surrounding areas in an attempt to exterminate the Waldensian Bible-believing Christians. 1572 A.D. – Roman Catholic soldiers butchered upwards of 100,000 French Protestants (Huguenots) during the St. Bartholomew massacre that started in Paris. Butchery of Protestants then spread to the countryside. The (Roman Catholic) king of France had cleverly arranged a marriage between his sister and Admiral Coligny, the chief Protestant leader. There was a great feast with much celebrating. After four days of feasting, the soldiers were given a signal. At twelve o’clock midnight, all the houses of the Protestants in the city were forced open at once. The admiral was killed, his body thrown out of a window into the street where his head was cut off and sent (first to the Roman Catholic Cardinal of Lorraine, and then on) to the pope. They also slaughtered many other well-known Protestants. In the first three days, over ten thousand were killed. The bodies were thrown into the river and blood ran through the streets into the river until it appeared like a stream of blood. From Paris, the destruction spread to all parts of the country. Very few Protestants escaped the fury of the Roman Catholic persecutors. At Orleans, a thousand were slain of men, women, and children, and six thousand at Rouen. At Meldith, two hundred were put into prison, and later brought out by units, and cruelly murdered. At Lyons, eight hundred were massacred. Here children hanging about their parents, and parents affectionately embracing their children, were pleasant food for the swords and bloodthirsty minds of those who call themselves the Catholic Church. Here three hundred were slain in the bishop’s house; and the impious monks would suffer none to be buried. At Augustobona, on the people hearing of the massacre at Paris, they shut their gates that no Protestants might escape, and searching diligently for every individual of the reformed Church, imprisoned and then barbarously murdered them. Upon hearing of the bloodshed in Paris, Pope Gregory XIII celebrated by declaring a jubilee day of public thanksgiving. 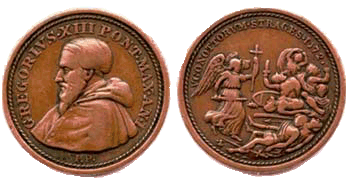 Guns were fired in salute and the Pope ordered the striking of a commemorative medallion. King Louis XIV then orders his murderous dragoons to persecute the French Protestant Huguenots which resulted in 500,000 innocent Protestants (men, women, and children) being butchered! The Popish French governors in each parish declared that the king would no longer suffer any Huguenots (French Protestants) in his kingdom, that they had to change their religion and become Catholic, either freely or by force. You can read the gruesome details as recorded in Fox’s Book of Martyrs. So you can clearly see that the French people had obeyed the orders of the Popes of Rome, to shed the blood of the saints in France; and now it is time for their blood to be shed, as Messiah exacts vengeance for His saints. Now the French people would have their blood shed in the very same places. And the rivers were filled with their blood. Piedmont, in northern Italy, which had all but exterminated the Waldenses, and turned their wild and lonely valley into a slaughter-house, was overrun by merciless invaders, and filled with the horrors of ruthless spoliation and bloodshed. That is would succeed the first mentioned, and apparently, at a period not remote. That it would occur in a region where there had been persecution. It would be in a country of streams, and rivers, and fountains. It would be a just retribution for the bloody persecutions which had occurred there. Again in 1799 the “fountains of waters” were dyed in blood, the French having suffered reverse and been driven out of all the placed they occupied in North Italy with much bloodshed. There are two marks given which help us to locate the seat where the plague of the third vial is poured. 1. It must be a region of rivers and fountains of waters. 2. It has evidently been the scene of terrible persecutions of the people of God. 3 – BibleStudyTools.com Book of Martyrs -The Bartholomew Massacre at Paris, etc. The People’s New Testament Commentary – Revelation 16? History Unveiling Prophecy by Henry Grattan Guinness?